A brand new Bridal Accessory Boutique will be coming to Keynsham soon and they are currently looking for two part time staff. Bridezillas will be a new and exciting concept in the South West, where brides can choose from a range of gorgeous veils, tiaras, jewellery, parasols, garters, hats and more in comfort and style. Bridezillas owner Amanda says "we aim to offer you a top class & friendly service that you cannot get when shopping online. Being able to touch, see and try on your accessory is vital when wanting everything to be perfect for your special day. We will also be selling beautiful romantic gifts based around love and marriage. Wedding Planning and Bridal Makeovers will also be making special visits to the shop. This is a bridal boutique with a difference". Here's a few examples of pretty tiaras that will be available to buy. Amanda also hand makes her own range of jewellery called Abigail Grace that will be stocked in store. 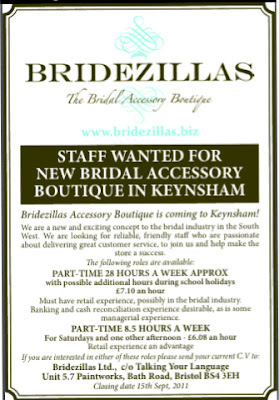 Bridezillas are looking for someone with retail and managerial experience to work 28 hours per week and someone else to work on Saturdays and one afternoon (8.5 hours per week). If you are interested in applying see the advert below for details. For more information on Bridezillas, you can visit their facebook page here. We'll be sure to keep you posted on the opening of the store as we are officially excited about Bridezillas.